Dr. Nathan White is an emergency-medicine specialist at Harborview. A small, plastic-and-silicon card to rapidly detect blood-clotting deficiency is under development at the UW. Immediate test results on clotting ability are vital to successfully treating people who have sustained severe injuries. One-fourth of severely injured trauma patients have impaired blood clotting and face an increased risk of dying, said Dr. Nathan White, a UW assistant professor of medicine in the Division of Emergency Medicine who helped develop the device. Nathan Sniadecki, lead investigator for the project, displays the plastic-and-silicon card. 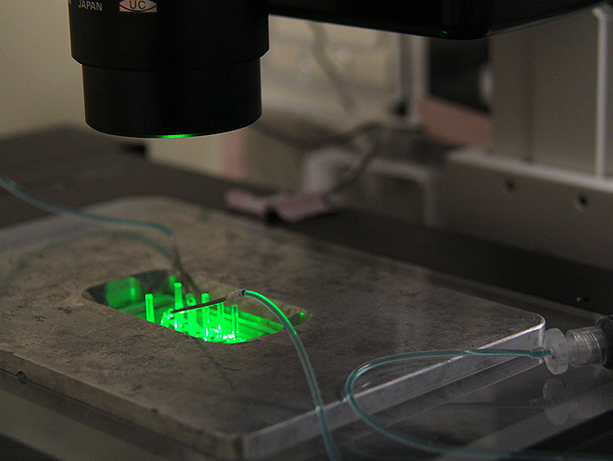 The card works by controlling blood flow over tiny, protein-coated posts. Platelets, a type of blood cell, adhere to the posts and initiate a clot. Technicians can monitor how much force the forming clot generates when it contracts against the posts, and use that data to determine the clot’s strength and how long it will take to break down. They can simultaneously watch clot formation under a microscope. Nathan Sniadecki, UW associate professor of mechanical engineering and lead investigator in the project, began developing the device after White suggested Sniadecki apply his work with cell mechanics to trauma care. The two have collaborated on the project with postdoctoral scholars and graduate students in Sniadecki’s Cell Biomechanics Lab. The ability of blood to coagulate is critical in trauma patients who have deep wounds and extensive bleeding. It is also critical for physicians to detect blood-clotting deficiency quickly. Devices currently used in emergency rooms to detect blood clotting strength were not developed specifically for use with trauma patients, White said, and are therefore less useful in trauma care. Lucas Ting, a postdoctoral scholar who developed core technology for the clotting testing device, places it in a specialized microscope used to monitor clot formation. Starting in 2015, the researchers will conduct a clinical trial of the device at Harborview Medical Center. They expect the device to be available commercially in about three years.